Patrick Sullivan, one of ten children, and a graduate of Peoria High School, has a long history of participation in youth organizations such as Boy's Club, Proctor Center, Taft Homes, and the Peoria Park District. A standout amateur boxer as a teen-ager, he was a member of the Peoria Boxing team in 1969, won the Peoria Invitational, and took second at the state tournament. In 1970-71-72, he took first place in both tournaments. Boxing kept Pat out of trouble. Therefore he moved into coaching, tutoring young people in the sport of boxing. SULLIVAN'S LAW was: "A busy kid is a kid not in trouble." 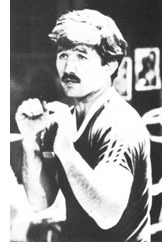 In 1972-73, he organized his first boxing club at Trinity Lutheran Church. In 1981, because of his concern for getting kids off the street and the demand for his boxing expertise, he founded the Peoria County Boxing Club in his garage in West Peoria. With the help of friends, the club moved to a warehouse in Peoria Heights, using fund-raisers to pay the rent. He was instrumental in bringing the National Silver Gloves Tournament to Peoria on two occasions, and brought back Golden Gloves competition in 1986. Pat spent four nights a week at the Boxing Club directing practice, as he wanted to offer young people a place to become involved in athletics. No one was turned away who couldnít pay. Sullivan was co-ordinator of the Amateur Boxing Association, Eastern Section, for many years, and was vice-president of the Illinois Amateur Boxing Association. No longer active in boxing, he continues to work with youth groups where his children are in school. Patrick Thomas Sullivan is an unsung hero having made a tremendous influence on the lives of scores of young people. ©2003-2019 Greater Peoria Sports Hall of Fame, Inc. All Rights Reserved.